Fig. 1 3-dimensional morphological image of a mouse ear obtained by OCDV. Fig. 2 2-dimensional en face tomographic visualization of capillary blood velocity of a mouse ear obtained by OCDV. Fujimoto, J., et al., The Development, Commercialization, and Impact of Optical Coherence Tomography, Investigative ophthalmology & Visual Science, Vol.57, No.9, (2016), pp. 1-13. Vivek J Srinivasan, et al., Micro-heterogeneity of flow in a mouse model of chronic cerebral hypoperfusion revealed by longitudinal Doppler optical coherence tomography and angiography, Journal of Cerebral Blood Flow & Metabolism, Vol.35, (2015), pp.1552-1560. Schmitt, J. M., “Optical Coherence Tomography (OCT): A Review”, IEEE Journal on Selected Topics in Quantum Electronics, Vol. 5, No. 4, (1999), pp. 1134-1142. Tearney, G. J., et al., “High-speed phase- and group-delay scanning with a grating-based phase control delay line”, Optics Letters, Vol.22, Issue 23, (1997), pp.1811-1813. Furukawa, D., et. al., “in vivo Micro-tomographic Visualization of Capillary Angio-Dynamics around Upper Dermis under Mechanical Stimulus using Low Coherence Interferometer “Optical Coherence Doppler Velocigraphy”, American Journal of Physics and Applications, Vol.6, 4, (2018), pp.89-96. 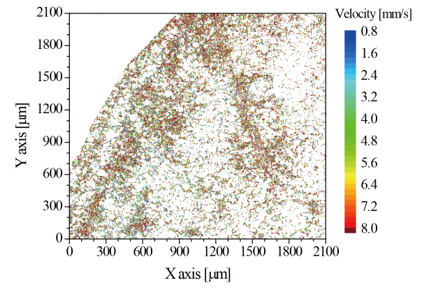 Sugii Y., et al., “Blood Flow Velocity Measurement in Microcirculation Field by Means of Highly Accurate Iterative PIV”, Trans. JSME B, vol.67, No.662, (2001), pp.2431-2436 (in Japanese). Hara Y, et al., “Visualization of viscoelastic behavior in vivo skin using optical coherence tomography-based straingraphy combined with suction device”, Mechanical Engineering Letters, 4 (2018), pp.17-24. Hara Y, et al., “Visualization of viscoelastic behavior in skin equivalent using optical coherence tomography-based straingraphy”, Skin Research and Technology, 24 (2018), pp.334-339. Saeki, S., et al., “Non-invasive Micro-tomographic Visualization on Viscoelastic Behavior of Articular Cartilage using Low Coherence Interferometer (Dynamic Optical Coherence Straingraphy) ”, Journal of the Japanese Society for Non-destructive Inspection, Vol.67, (2018), pp.166-173, (in Japanese). Yamane K., Saeki S., Furukawa D., “Basic Study on Micro-tomographic Visualization of Tissue Deformation using Optical Coherence Doppler Velocigraphy Applying Acoustic Radiation Pressure”, 29th Biofrontier Conference, 1B34, (in Japanese).